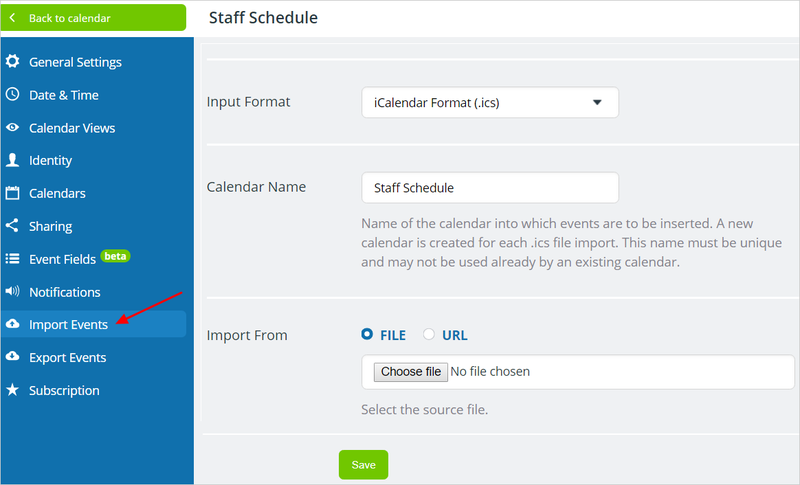 With Teamup Calendar, you can import events from other calendar applications, spreadsheets, databases, and text files. Currently, supported import formats include iCalendar files (*.ics files) and text files with comma-separated values (*.csv files). Note that the importing feature is meant for a one-time transfer of data from a third-party application to Teamup Calendar. It does not offer ongoing synchronization. If you want ongoing synchronization between your Teamup Calendar and an external calendar source, please read about iCalendar feeds. To use the import feature, go to Settings > Import Events. The import feature is only available to calendar administrators. The importing tool currently supports two sources for data: files stored on your computer and files accessible from a link (URL). The second option can be particularly handy as many calendaring applications support the export of data through iCalendar feeds, which are links (URLs). If a feed is available for the application you are importing from, simply copy and paste this feed URL into the import tool. Importing from .ics files: Each import creates a new sub-calendar. Data cannot be added to existing sub-calendars. You are required to enter a name for the new sub-calendar in the Import settings. Events with a calendar name specified in the source .csv file: A sub-calendar with the same name must already exist. The new events will be inserted into the existing sub-calendar. Events with no calendar name specified in the source .csv file: A calendar name is required in the Import settings, to which the new events will be imported. A calendar name in the Import settings will be ignored for events that have a calendar name specified in the source .csv file. If all events have a specified calendar name in the source .csv file, a calendar name in the Import settings is not required. If at least one event does not have a calendar name specified in the source .csv file, a calendar name in the Import settings is required. If you have special importing needs, we suggest that you talk to us first. We might be able to help you with suggestions to make the process easy. The iCalendar file format, often called ics format or ical format, is a widely used and standardized format for the exchange of data between calendar applications. If you plan to migrate from another calendar solution to Teamup, we recommend that you first check if it supports the iCalendar format. This is the easiest and most reliable way to migrate calendar data. A CSV file (comma-separated values) stores tabular data in plain text. It is a widely used format for data exchange and is supported by many spreadsheets and database applications. This first line of a CSV file is a comma-separated list of field names. Subsequent lines are data records; in our case, these are calendar events. The following table defines the supported field names and their format. Subject No Event title. Up to 255 characters in length. End Date No End date of event. For supported formats see above. End Time No End time of event. For supported formats see above. All Day Event No The All Day Event flag defines if an event is an all-day event or an hourly event. Supported values are “True” and “False.” If no value or an unsupported value is specified, “False” is used by default. Location No Location of event. Up to 255 characters in length. Who No Participants of event. Up to 255 characters in length. RRule No Recurrence rule according to RFC 5545 iCalendar. An example is “FREQ=WEEKLY;COUNT=3” for an event that repeats weekly for three times. Please note that Teamup supports only a subset of the recurrence rules as defined by the specification. To learn about supported rules, we recommend creating some repeating test events using Teamup in the web browser. Then, export the test events in CSV format to see how the recurrence rules are represented. Calendar Name No Name of calendar into which the event is to be imported. Up to 100 characters in length. Note that events can be imported into an existing calendar. If no calendar exists with the name specified, a new calendar will be created. If an event is to assigned to multiple calendars, then this field must contain a list of all calendars separated by the pipe characters (“|”). Description No Description of event. Up to 16,000 characters in length. Simple formatting of the text is supported following the markdown approach. See Common Mark specification for a 2-minute introduction to markdown formatting. <Custom Field Name> No Teamup supports custom event fields. Custom event fields are user defined fields added to calendar events. Currently, three types of custom event fields are supported: Single line text, single choice, multiple choice. The import of values for custom fields is supported and works identically to the standard event fields. See example 3 below. "choice 1, choice 2, choice 3"
"Subject","Start Date","Start Time","End Date","End Time","All Day Event","Location","Who","Description"
"Project Meeting","02/12/2016","2:00pm","02/12/2016","4:00pm","False","Conf. Room A","John, Mark",""
Linda in Paris,02/15/2016,,02/15/2016,,True,Paris,Linda,In case of emergencies I am reachable by email. "Subject","Start Date","Start Time","End Date","End Time","All Day Event","Project Type"
"Project Meeting","02/12/2016","2:00pm","02/12/2016","4:00pm","False","Research, Internal, Not Billable"
The order of fields does not matter. It is important that all lines use the same order. Field values can span multiple lines. Field values must be wrapped in quote characters (“…”) if the field value contains commas or spans multiple lines. Otherwise quotes are optional. "The importance of the "" character"
When importing into an existing sub-calendar, there is no update of existing data. Duplicate events will be created.